This event has been organised by Photography/Archives/Ireland, which involves three academics/researchers – Ann Curran (DIT), Fiona Loughnane (NCAD) and Dr. Orla Fitzpatrick (NMI) – who share an interest in photography and the archive. The talk takes place immediately before the launch of the PhotoIreland Festival 2018, with Laia Abril’s internationally celebrated project ‘On Abortion’ at the Copper House Gallery at 6pm,Thursday 3rd May. The extended struggles over reproductive rights in Ireland represent what Lauren Berlant has termed a “politics of the long haul.” The upcoming referendum to repeal the Eighth Amendment, as well as the anniversary of women’s suffrage, provides us with a threshold moment in which to discuss the visual politics of the Pro-Choice movement, focussed on the work of three photographers: Laia Abril, Emma Campbell and Sarah Cullen. All three artists engage with critical readings of the photographic archive, from feminist perspectives, to demonstrate and deconstruct the extensive historical, cultural and social repercussions of restrictions on abortion and other reproductive rights. They make the lived realities of the histories and stories of women visual, visible and public, as part of a multi-faceted activism committed to instigating change. Photography and photographic technologies have been central to campaigns by both the international Pro-Life and Pro-Choice movements, from Lennart Nilsson’s foetal images, published in LifeMagazine in 1965, to the infamous photograph of the corpse of Gerri Santoro The photograph has thus been co-opted to serve both agendas, where its status as evidence and its relationship to the ‘real’ are often assumed rather than interrogated. This event brings together a group of artists who embrace the complexity of the visual and material culture around this issue. Each of their practices draw upon the role of photographic archive in the production of meaning in order to represent a range of perspectives on the multiple injustices that attend the denial of bodily autonomy to pregnant persons. Laia Abril is a multidisciplinary artist working with photography, text, video and sound based in Barcelona. Abril’s projects are produced across platforms as installations, books, web docs, and films. Her long-form project A History of Misogyny is a visual research undertaken through an historical and contemporary comparative framework. In her first chapter, “On Abortion”, Abril documents and conceptualises the dangers and damages caused by women’s lack of legal, safe and free access to abortion. Using extensive research methodologies, Abril draws on the past to highlight the long, continuous erosion of women’s reproductive rights to the present-day. She weaves together visual, audio and textual evidence to construct questions about ethics, morality and stories around abortion that have been invisible until now. Emma Campbell is a photographer and activist based in Belfast. Her work explores the issues raised by the lack of abortion access for women on the island of Ireland. The stigma and secrecy combined with the attitudes fostered by colonialism and deep religious conservatism are dealt with in a variety of ways, inspired by practices employed by the women photographers in her historical research. This includes photography of direct actions, using the gallery space as an activist space, sharing her practice online to raise awareness, using collage, documentary and found images to produce work that fosters a sense of the structural inequalities that face women faced with decisions about their pregnancies. Sarah Cullen is an artist based in Dublin who works with a broad range of mediums including photography, moving image and textiles. 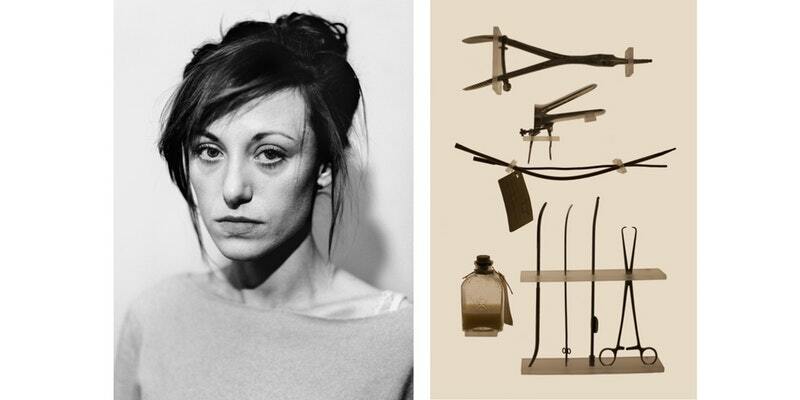 Her practice focuses on issues of mortality and women’s rights in relation to the self and the domestic space. She explores the relationship between the public and the private: how personal narratives and experiences change and interact with the world when introduced into a public space. Her activism in the Repeal the Eighth movement has informed her recent work, with a focus on creating large scale textile banners which draw on the history of women’s use of textiles and embroidery to enact and communicate resistance. Previous PostWin the complete set of Blow Photo!